From Athens airport to Piraeus port, you have three modes of transportation to choose from, a public bus, a metro line and the standard taxis. Taking an Athens airport taxi is the fastest and most convenient transfer option, but costs 54-70€. A cheaper option is the bus, which costs only 6€, but takes over an hour. The final transfer option is the metro. This mode of transport costs 10€ one-way and takes around 85 minutes to reach Piraeus port. Welcome Pickups offers meet and greet services and a friendly introduction to Athens at the same price as a regular taxi. Click here to see the cost. Taking an Athens airport taxi from the airport to Piraeus port is by far the most convenient transfer option. The journey only takes 40 minutes, and you don't have to worry about the safety of your luggage or your arrival time. Standard yellow taxis cost a flat rate of 54€ in the day and 70€ at night. However, there are also 'luxury' black taxis waiting outside Athens airport, and these can cost up to double that of a standard taxi. Taxis are charged on a flat rate to Piraeus Port and Piraeus Cruise Terminal. In the day (05:00-24:00) it will cost 54€, and at night (00:01-04:59) it will cost 70€. *It is advised to pre-book your Athens airport transfer in order to make sure that you get the best service available. Taking a taxi from Athens airport is really convenient, considering the large 50km distance from Piraeus port from the Airport. There is no direct access from one to another, you will need to go through the city centre or through the city’s South suburbs and head North. So, with no need to change lines or companies, a taxi is the easiest transfer option. With the summer heat and 50km long journey to Piraeus port, it's much more comfortable to ride in your own taxi, rather than rubbing shoulders with strangers on the Metro or the bus. The metro station is only a 10-15 minute walk from the arrival gate. In general, the Athens metro is modern and convenient, but in order to reach Piraeus port from Athens airport you will need to change from line 3 (the blue line) to line 1 (the green line). The green line isn't very modern, often experiences delays and during rush hour, isn't very safe. The journey will cost 10€ one-way and will take around 85 minutes in total. How much is the Metro from Athens airport to Piraeus port? From Athens airport to Piraeus port costs 10€ for a one-way ticket. Children under 6 years old can use the Metro for free. The Metro runs daily from 6:35 until 23:35. The entrance to the station is outside of Athens airport. You will need to follow the signs and go up one level to reach the main station area. After buying your tickets, you will then go down the escalators to track level. 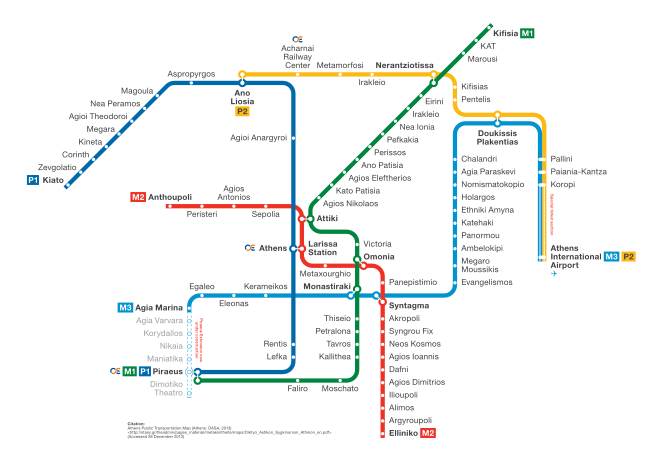 From Athens Airport metro station you need to take the blue line (line 3) to Monastiraki station. At Monastiraki station you will then transfer to the green line (line 1) and head to Piraeus Station. Considering the total journey time and the fact that you need to change trains, taking the Metro is the least convenient mode of transport from Athens airport to Piraeus port. Unless you know the Metro lines and the city well, making changes and navigating the Metro stations can be difficult. If you have a ferry waiting for you in the port, an easier mode of transportation is suggested. There is only one bus line running directly from Athens airport to Piraeus port, and that is the X96. This bus runs 24/7 and departs every 15-30 minutes. Tickets cost 6€ and the journey time is a tiring 90 minutes. How much are the buses from Athens airport to Piraeus port? The price for an adult is is 6€, and for children or students aged 7-18 and seniors over 65, tickets cost 3€. Children under 6 travel for free. You can find the bus stand directly outside of the arrivals gate, between exits 4 and 5. The X96 bus runs 24/7, even during the holidays, so no matter what time you arrive to the airport you can hop on. However, the route is through some very old roads, so the journey can be extremely long and uncomfortable. If you are in a rush for your ferry, this may not be the transportation option for you. If you have some time on your hands, or are on an extremely tight budget, then opt for the bus. However, if I'm in a rush to get to my ferry, we would personally recommend one of the other two options. According to your ferry departure gate you might need to step off the bus before the end destination, check with the driver! How far is the port from Athens Airport? Athens airport is a fair distance from Piraeus port at 45km. In a car or taxi it can take around 50 minutes to reach the port, and that's with light traffic. How much does taxi cost from Athens airport to Piraeus port?